Latin America is a land which geographically includes Central America, South America and the Caribbean. Christopher Columbus was the first European ever who went to Latin America. He was sent on a mission by the Catholic king of Spain to travel to remote areas in order to expand the Spanish territory. The Pope divided the newly discovered lands between the two superpowers of the time, Spain and Portugal, in an announcement in 1943. 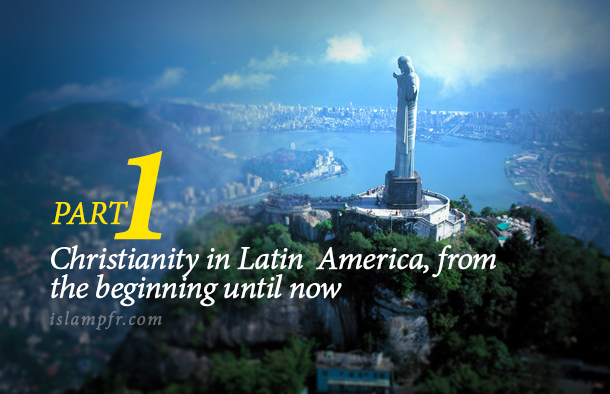 Christian missionaries began their activities concurrently with the discovery of the new lands. Religious bodies always accompanied intruders. Where ever the victors went, church representatives along with representatives of the king used to go there as well. In fact where ever the conquerors entered, they placed the cross next to the flag of the Spanish empire and tried to justify their conquests as spreading Christianity. Consequently, Christian Europeans dominated North and South America and most residents of these areas, at least pretentiously, converted to Christianity. Christianity, in this region, has seen many ups and downs. This article is a report on the history of Christianity and the latest activities of Catholics, Protestants, theology of liberation, etc. in the region. In the last decade of the fifteenth century the Spanish Christians, by uniting two families of Catholic Isabel (Queen of Castile) and Fernando (King of Aragon), were able to defeat Muslims and drive them out of the area –which was referred to as Andalusia by Muslims – and returned the land to Christendom. Although these Christians defeated Muslims, they were still thinking of expanding their territory. (Galeano, 1971; Stavrianos, 1981). Christopher Columbus was sent to his great mission by the Spanish in the same year; to go to remote areas and expand the powerful Spanish territory and bring a lot of gold and wealth to this country. No one ever imagined that the universe could expand and a new continent would be discovered and Spain would own a major part of the new world. Mexico, Central America, the West Indies and much of South America was dominated by the great Spanish Empire (Galeano, 1971). When, in 1492, Christopher Columbus stepped into the lands of the Bahamas, the very friendly behavior of the indigenous people surprised him as he reported that the people of the area are so kind as if they want to donate their hearts. But very soon, the same Columbus, wrote to Spain: “From here, in the name of the Holy Trinity, we can send many slaves for sale… If your majesty commands, all the residents here, can be moved to Castile or can be enslaved here as these people have no skills in warfare” (Stavrianos, 1981). Columbus in 1495, commanded the battle against the natives of the Hispaniola Island  and sent five hundred Indians as slaves to Seville, Spain. The slave trade, due to illness and death of nearly half of the Indians, did not happen in this transition and of course, this does not mean that Indians were not enslaved in the region. Columbus began gold mining as a means to fulfill the ambitions of himself and his masters (ibid & Galeano, 1971). It is also interesting to know that “Columbus” in Latin America,  means “messenger of Christ”. Fernando and Isabel were aware of the jealousy of other kings of Europe, especially the king of Portugal; therefore, in order to consolidate the ownership of Spain over these lands they appealed to the Pope; as at that time, the assignment and allocation of power, properties or lands among the Christian princes were within the Pope’s authority. The king of Spain in that era was fortunate as another Spanish was elected as Pope (Alexander VI); thanks to the efforts of the previous kings of Spain. In May 1494, Pope Alexander VI issued a pronouncement as “Inter Coelera” in which by drawing an imaginary line on the world map, the newly discovered areas were divided between the two superpowers of the day. The western part was granted to Spain and the eastern part which later was revealed to be only Brazil, was granted to Portugal. After long negotiations between the kings of Spain and Portugal, finally, in June 1494 the contract (Torde Sillas) was signed between them (Washburn, 1971; Saee, 1378). Spanish missionaries, began their religious activities simultaneously with the discovery of new lands. Christian religious bodies always accompanied the intruders. Whenever a city was built, it took a religious name and there was always a priest to pray for blessing. The church was always one of the first buildings to build. Wherever conquerors went, the Spanish King and Church representatives accompanied them as well, in a way that some Christian authors believe where ever the Spanish conquerors entered they placed the cross next to the flag of the Spanish empire and tried to justify their conquests as spreading Christianity and the establishment of Catholic Christianity and the Holy sovereignty of the Pope (Mostafavi Kashani, 1374: 47; Masjed Jamei, 1379: 242-241). Pope Alexander VI also believed that Catholicism should be promoted around the world; therefore, he honored Queen Isabel with the title “First Lady of the New World” (Galeano, 1971). It was the Pope with whose unwavering support of European intruders, the Spanish could make the Indians of the region accept the Christian faith even by force, violence, intimidation and other inhuman behaviors and rules. The Spaniards developed a notice called “Requerimiento” which was written in Spanish. The only thing they did was that their official commander read this notice for the Indians. However, Indians could not get familiarized with its provisions. The introduction of the notice was talking about the world people’s unity and the reason of conquering the continent was mentioned to be the cohesion of the world. With this notice, they were inviting the Indians to convert to Catholicism. A part of this notice reads: “We want you Indians to obey the church and accept that the Pope is the holy father, you should also obey the king, as they are the true owners of your land…You must accept all the cases referred to in this Notice And if there is any opposition from your side, we swear to fight back by taking your women and children into captivity and slavery as well as taking all your food so that you lose as much as possible. This is the penalty for those who oppose the church. You should promptly sign this notice after it is read” (Galeano, 1971; Washburn, 1971). Consequently, a great number of region’s residents were slaughtered. Christian missionary activities in new territories. During the colonial period in Latin America, Pope Clement VI, in order to facilitate the dissemination and spread of Christianity, in 1508 A.D., granted a right to Queen Isabel by which the Church in Latin America was ruled by royal decrees and various taxes from the continent were given to the King of Spain. Hence, during the early days of the colonization, the number of priests and monks who went to the new continent were no less than the number of Spanish government officials. Pope’s unwavering support for the rulers of the new world, provided them with the right to allocate all the benefits and privileges of the church to themselves, to the extent that the local religious authorities could not communicate directly with Rome (Galeano, 1971). Pop in a letter, in May 1529, writes to Charles V, King of Spain, about the newly discovered world: “We believe in your sovereignty. We promise you that we provide viable Catholicism in these lands, otherwise we will resort to force …” (Washburn, 1971). Spanish missionaries’ Method was that at first, in various regions, they used to select relatively large plots of land and build a wall around it. And then, they built a church in that area. Then gradually, based on the need and support of European rulers, other buildings such as schools, hospitals, and agricultural and industrial classes were built around the church. In these schools, Indian learned the preliminaries of agriculture as well as all kinds of industries and professional principles and also they got familiarized with the culture and European customs and religious music (Elder, 1971). Priests baptized Indians in large groups of thousands. Indians were often forced to participate in such a ceremonies. “Franciscan” monks  alone, baptized more than one million Indians within twelve years after the discovery of the new continent and led them to Christianity. As it is estimated, until 1536, this group of monks baptized four to nine Indians daily. Some sources have reported strange and unbelievable data that some priests baptized up to fourteen thousand people daily. Aside from the accuracy of these reports, of course, those who had been baptized with such rush and extent and under pressure and force, could not have deep knowledge on the religion. Therefore, Christianity in the region was based on Indian religious foundations. Some churches were built on pillars or former places of indigenous temples. And the beliefs and superstitions and traditions of old Indians had entered into the religion to the extent that Christianity, among the Indians, had lost its true nature and reality and become a mere ritual. Promoting Christianity through coercion, and intimidation of death and slavery caused the objection of some priests. This incident caused the king of Spain to hold a meeting in order to discuss the issue with the participation of ministers and his advisers. Two of the priests of the Church, namely Bernardo Mesa and Gary Goria participated in that meeting. They believed that slavery was suitable for the Indians. “Burgos Law” Act 1512, was the result of the mentioned meeting which could to some extent bring peace between the opponents and proponents of the Indian groups and on the other hand it also considers part of Indians’ shattered independence; however, the acceptance of Catholicism was still seen as an initial condition which was the Spaniards’ duty to promote. Another law called “Encomienda”  was adopted at the same time according to which Indians were supposed to grant full authority of monitoring their lands and assets to the Spaniards! The enforcement of this law was issued by the church (Washburn, 1971). One of the despicable points of Christian missionary activities in Latin America is the racism of most of the priests and Catholic churches. Many priests in the area, which until the nineteenth century came from Europe, had selfish and racist spirit. Of course, few of them also believed that poor Indian culture is rooted in the lack of educational institutions in Indian society (Washburn, 1971). In the following the philanthropic activities of some priests and responses of other priests and the Spanish empire will be discussed. Many priests, offered religious justifications for Spanish rulers’ inhuman actions. For example, Juan De Queda Archbishop of Venezuela, in a letter to Charles V in 1512 wrote: “The Indians are ignorant compared to other people in the world and we have to practice slavery in order to guide them. Most of the religious and political figures of the region had the same opinion about the Indians. However; during the same period, “Bernardo Minaya” traveled from Peru to Rome in order to solve the problems of the Indians, in order to share these problems with Pope Paul III And notify him of the status of Indians and natives of the region (ibid. 22). Minaya , in this trip, was able to gain the Pope’s sympathy leading to the Pope’s criticism of the inhuman nature of the Spanish invaders’ behavior. Pope Paul’s sincere efforts were not successful. Charles V, the King of Spain ordered the seizure of all his books and papers lest not even a word of them reaches the Indians. Minaya tried, in various ways, to get Pope Paul III’s books to Indians; however, he was immediately arrested and imprisoned by order of the Government of Dominica. European conquerors of the region continued their inhuman behaviors against the Indians and natives of the area. Rev. Bertolome De Las Casas at this time began efforts to defend the rights of the Indians. Based on his follow-ups, a meeting which was comprised of the advisory board of religious scholars was held. In this meeting the wars that occurred in Indians’ residential areas were discussed. Many opponents of Casas, were the priests. One of his serious opponents was priest Juan Gines. Another proponent of Casas was a priest named Sepulvada. He insisted on the opinion of leading ignorant people and Indian slavery, saying: “under certain circumstances, it is our natural right to seize a land by force. We know that the Indians are very ignorant and should be led by superiors, but regarding the two groups of the dominant and the recessive, see the blessings that Spanish civilization has granted to them, these blessings include magnanimity, humility, etc.” Casas, in order to reject Sepulvada’s opinions wrote a treatise which consisted of 550 pages. In his treatise he noted that: “People are equal and brothers, and Indians like the rest of the people are blessed with emotions and wisdom.” (ibid. 25). Another priest who was against slavery, was someone called Antonia Vieria, of the “Jesuit”  cult. In Brazil, he did brilliant services such as those done by Casas. Vieira, like Casas, defended the rights of American Indians, and to reinforce justice he sought the help of Portugal’s king. Although there was a lot of opposition against him, he managed to slightly improve the situation of Indians (Elder, 1971). Someone else called the Rev. Pedro Claver (1581-1654 A.D.) who was, like Casas, from the Spanish nobles and also a caring and devoted man, fought for the rights of the Blacks. Claver was later sanctified by the Catholic Church and became known as the patron saint of the blacks. Toribio Robles, Archbishop of Lima also had plenty of motivation and enthusiasm to serve the residents of the region. He built so many roads, churches and hospitals and defended the rights of Indians and blacks strongly (ibid. 31). Most of the researchers have confirmed the cruelty of European rulers and have criticized it. Spanish leaders and officials were ruthless and profit-seeking people whose only aim was plundering the wealth of Indians and other local residents. Consequently, the only defenders of indigenous people’s rights were a few preachers who sometimes stood against the self-interest, greed and cruelty of the majority. Despite the efforts of these people, the enslavement of Indians and natives was natural in the opinion of most European missionaries and it was the same group who promoted the theories of “leading the ignorant” and “slavery” to satisfy the kings’ greed. Stavrianos, L. S. (1981). Global rift: The Third World comes of age. New York: Morrow. Chicago. Stein, S. J., & Stein, B. H. (1970). The Colonial Heritage of Latin America. New York: Oxford University Press. Bashiriyeh, H. (1997), political sociology: the role of social forces in political life, Tehran: Ney Publication. Beals, C. (1974). Latin America: World in Revolution. Greenwood Press. Elder, John (1971). History of the Christian Church from 1600 until 1970. Rasten, Leo (2006). Analytical Dictionary of American religions. Saee, A. (1999). Masaele Siasi-Eghtesadi Jahane Sevom, Second Edition, Tehran: SAMT Publication. Fekri Ershad, M. (1970). Masaele Amrikaye Latin, vol. 1, Tehran: Tous Publication. Galeano, E. (1971). Las venas abiertas de América Latina. Monthly Review Press. Grenz, S., & Olson, R. (1993). 20th-Century Theology: God and the World in a Transitional Age. IVP Academic. Masjed Jamei, M. (2000), Goftogooye Dini, GoftogooyeTamadoni (Eslam va Masihiat dar dorane jadid), Tehran: Poorshad Publication. Mostafavi Kashani, L. (1989). Overview of liberation theology. Tehran: International Book Institute. ________ (1995). Payane Sad Sal Tanhayee, Seyri dar Eteghadate Mazhabi Mardom Amrikaye Latin . Tehran: Center for International Studies and Research. McGrath, A. E. (2001). Christian Theology: An Introduction (often used as a seminary textbook). Blackwell Publishers. McLellan, D. (1997). Political Christianity – A Reader. SPCK Publishing. Andrew Walls. (2006). Christianity in today’s world. Hemmati, H. (Translation and Edit) (2000), Moghadamat Elahiat Moaser, Tehran: Naghsh Jahan Publication. Haynes, J. (1999). Religion, Globalization and Political Culture in the Third World. Palgrave Macmillan. Hinnells, J. R. (1996). Who’s who of Religions. Penguin Books. Editor: A. Pashaii, Qom: Center for Religious Studies and Research. Eliade, Mircea (1997), the encylopedia of religion, vol.3, New York: Routledge. Boff, L. (2003). Liberation theology, a quick look at the History of Thinking. Rabbani, M. (2010), “Jaryan Shenasi deen va siasat dar Amrikaye Lation” (dialogue), Pegah Hozeh Biweekly, No. 277. Sadatifar, A. (2009), “Ravabet Iran va Amrikaye Latin; Forsat ha va Zaroorat ha”, (dialogue), Pegah Hozeh Biweekly, No. 262.
. In these battles, which lasted ten years, Granada, the last stronghold of Muslims also fell; but, the weakening of Muslims had begun many years ago. Andalusia’s capital city Cordoba was conquered in 1236 by Fernando and joined to the Christian Spain. Confronting the Muslims and their expulsion lasted until 1600.
. Hispaniola: Currently, it is an area that includes Haiti and the Dominican Republic.
. In Latin America, Columbus’s famous name, in Spanish, is Cristóbal Colón.
. Franciscans: Sect of Christianity who travel in different areas as mendicant monks. The founder of this sect is St. Francis of Assisi (1182-1226) who is considered as one of the most popular saints and famous Christian mystics. Simple lifestyle and formation of this cult ensures the criticism and even rejection of the official Church’s wealth and power (Cox, 1999).
. Encomienda: it is an official title which is, along with special properties, given to the nobles and commanders by the King of Spain as a fief due to their presence in battles and the conquest of the lands for Spain.
. There is a possibility that the incentive for this travel was to rob the gold and wealth of this region.
. Jesuit: it is one of the major Christian sects. They have been very active in Latin America in the past and also at the present time. The sect was established in 1534 by Loyola (1491-1556 AD) the Spanish mystic.